Have to disagree. Upper deck is a very good lounge. Friendlier, more helpful staff, significantly better food than BA and more open and bright. BAs lounge provides a wider selection of self pour drinks but the corporate same same cheese, sandwiches other food makes it particularly dull. God awful lounge with an abysmal food selection. Their sandwich cutting technique during evening service is…. interesting. As a resident of Glasgow, I’d like to think that that it imbibes the ‘rough around the edges’ vibe of this city, but the routine incompetence is annoying as a regular user. Relatively open space & Belhaven Best on tap being it’s only saving grace imo. Some of us count the removal of the kids play area as a huge improvement. The previous design had zero sound proofing around the kids area – so the entire lounge was bombarded with noise – exactly the opposite of what I want in a lounge. The food offering is very hit or miss – the sandwich trays sometimes look like abandoned left offers from a raucous late night buffet. I go to lounges to relax or work rather than be in a kids’ play area. Clearly there is a need for kids play areas but separate sound proofed rooms not open to the main quiet lounge area would appear to be the format required. Probably more of a necessity with major long haul transit traffic such as Heathrow T5, although ironically not currently available………….. This is also the lounge KLM customers get sent to. I’ve been in it fairly often albeit always in the morning/lunchtime. For hot options, As well as the bacon rolls, there should be omelette rolls available and a huge tub of porridge. Weirdly you have to ask one of the staff for the omelette rolls, but they don’t seem to be cooked on demand as when they arrive they don’t feel freshly cooked. I wasn’t impressed with either of the roll options. The pastries are awful, for some reason they are always soggy. I prefer to use the BA lounge when I can – the BA lounge is also significantly nearer the BA gates. As Relaxo says, big windows, bright space and two draught beers (upperdeck’s own brand lager and Belhaven best) are the saving graces. This lounge is not part of the Swissport / Aspire brand. Entry also with DragonPass, available on the Barclays travel add-on. I travel through Glasgow a lot, and I find the Upper Deck lounge a complete embarrassment. The food is woefully inadequate – in December I found myself with a mouldy piece of bread on my plate. I haven’t been particularly impressed by the staff either. Thankfully, mostly I’m in the BA lounge which is far superior. Well clearly it’s not an equivalent to the BA lounge so it’s unfair to make the comparison – much better to compare with Aspire/No1 and it beats those lounges hands down. It is used by Lufthansa too. We used it before our trip to Hong Kong, first leg GLA-FRA at the very end of January before the flight at 1600. As to the lounge, no. No food at all apart from a few crisps + nuts and a couple of bits of curling bread with a slim grated cheese stuffing. Nothing much to read either. I think that the Starbucks at Abington Services on the M74 was about the same standard as the lounge — and I try to avoid Starbucks. sounds like most lounges I have ever been in at french airports. Bar the CX lounge in paris, that is. Whilst the BA lounge at GLA is decent and better than Upperdeck, I would struggle to call it impressive. It’s main redeeming feature is proximity to the gates for domestic flights. Maybe I’ve spent too long in there! It IS impressive. I used it the following day when I flew back to London, although nothing has changed since my previous review so I decided not to bother covering it again. Pop into Manchester if you’re not convinced! This Longe is poor, food poor too. Yes, it’s rubbish. Drinks and food crap. Those sandwiches I wouldn’t feed to my dog. I pity anyone who eats them. I tend to buy a sandwich in town and bring it to the airport. Oh and the lift is crap. It’s just a very tired airport, especially the international side. It’s like stepping back in to 60s Britain. I’m preferring EDI more. From 50 mins on the bus from Buchanan Street vs about 20-25 to Glasgow. Only a fraction more for the EDI bus than the rip-off Glasgow “Flyer”. The Upperdeck lounge is a good reason to choose EDI, not that EDI lounges are so much better, but I can sit in the Aspire lounge and look at the LH gates out of the window. At GLA there is no proper priority boarding setup and its a long walk to find out that boarding is delayed. Aspire has some decent free Malt in Aspire and passable salad buffet. 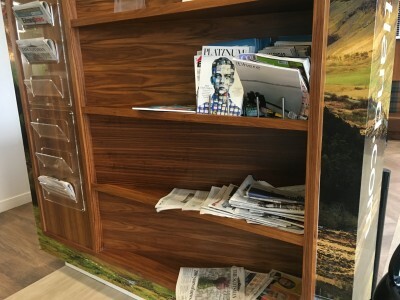 I always use the BA lounge at GLA which is absolutely fine – Rob nailed it IMO by describing it as giving “a sense of being apart from the crowds”. Staff at reception are friendly, knowledgeable and have been very helpful every time my flight was delayed or cancelled. 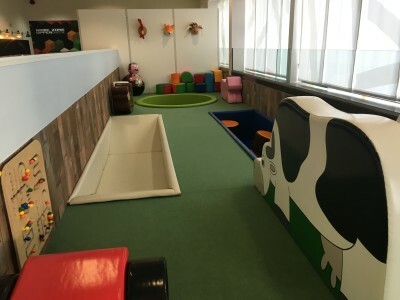 Visited the Upperdeck lounge a couple of times as a Flybe passenger, and what really put me off was the noise levels – which were not due to kids in the play area. Instead, it was package holiday makers who felt that they had to “tell” everybody what a bargain they had got given all the free booze they were able to consume. Maybe isolated incidents, but I have since avoided that place like the plague.